Extra crispy. Read all about it! The following are general steps of how my family makes pan fried dumplings (gyoza, potstickers or whatever you prefer to call them). All ingredients do not have to be exact and you can use more/less vegetables or protein depending on your preference. For example, you can use scallions and ginger with pork and skip the cabbage and carrots. You could also switch the protein for beef, chicken or turkey if you don’t like pork. 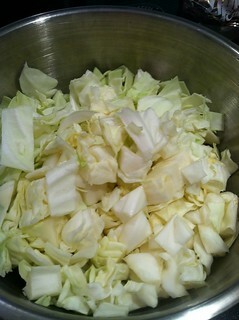 (1) Peel and wash the carrots, cabbage and scallions. 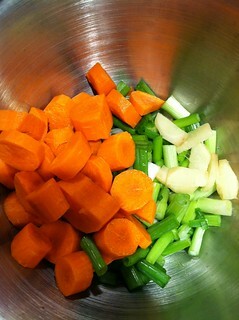 (2) Cut up all of the fresh ingredients (carrots, cabbage, ginger and scallions) into smaller pieces. This ensures that they will be diced more evenly by your food processor instead of ending up with large chunks of carrots/cabbage. 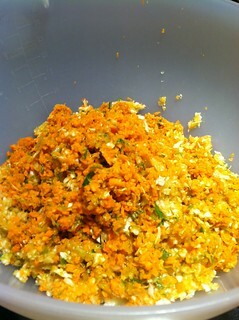 (3) Place the carrots, cabbage, scallions and ginger through the chop setting in your food processor. If you have a smaller food processor then you will have to put it through in batches. 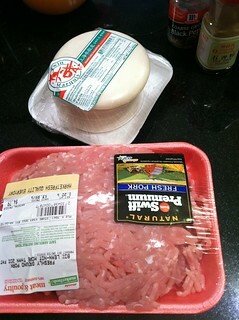 My family used to use a cheese cloth to wring the extra moisture from the veggies but I skip this step. 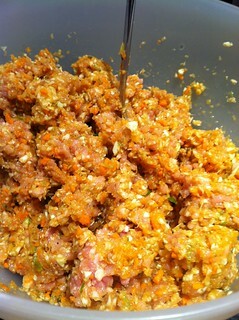 (4) Add the ground pork to the diced vegetables in a large mixing bowl. (5) Season to taste. I recommend erring on the side of less soy sauce otherwise you’ll end up with wet filling and it will be harder to wrap. You can always make a savory dipping sauce for flavor so it’s okay to keep it light on the seasoning. 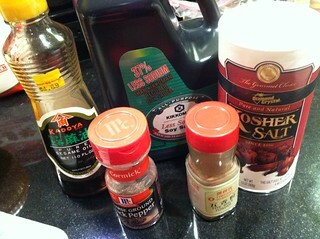 (6) Mix together the protein, vegetables and seasoning using a spoon (or your hands using latex gloves). There is no correct way to wrap a dumpling (as long as you close them securely so that they don’t fall apart during cooking). I doubt my method of folding them (pictured below) is the prettiest. Rather than reinventing the wheel, you can visit this link for a quick tutorial of how to wrap a dumpling (three different ways). You should freeze any uncooked pieces as soon as possible to prevent the dough from becoming soggy. I usually line the surface of my cutting board with tinfoil or cling wrap to prevent the bottom of the pieces from freezing onto the surface and ripping off when I try to remove them later. I like to keep my frozen extra dumplings into Tupperware or Ziploc bags. 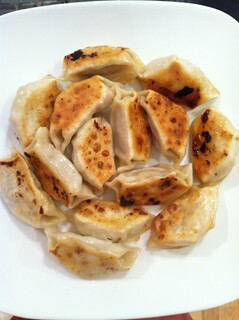 The cooking method I use for achieving perfectly crispy dumplings (fresh/frozen) is called the pan fry and steam method. Please follow the instructions I’ve outlined below. (1) Add oil to a non-stick pan and put on medium-medium high setting on your range. 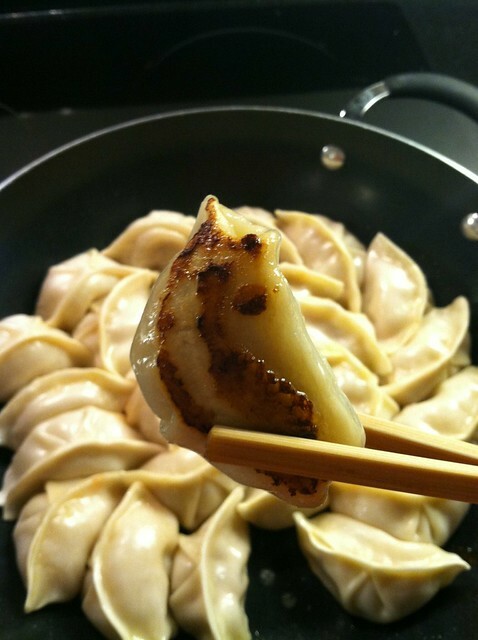 (2) When the pan is hot, arrange the dumplings in the pan. (3) Wait for the pan to get hot again (you should hear sizzling) and then add a quarter to half a cup of water. The water should coat the bottom of the dumplings but there should not be too much water (you are not trying to boil them). (4) Close the lid allow the water to evaporate and steam cook your dumplings thoroughly. 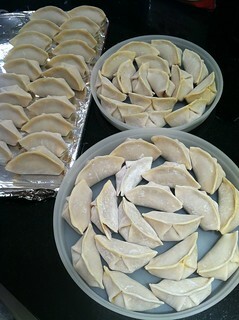 For frozen dumplings, repeat Steps 3-4 two to three times especially if you used a protein. For a crispier bottom keep frying the dumplings a few minutes after the water has evaporated. You can check the readiness by lifting a piece to see how charred it is on the bottom. I use a mixture of toasted sesame seeds, chilli paste, organic sugar, lite soy sauce and water to caramelize the yellow/white onions. My family likes to eat their dumplings with fresh garlic and soy sauce and I know other people like to eat it with soy sauce, ginger and vinegar. The combinations are endless. I used to enjoy eating mine with ketchup when I was little (don’t judge… ketchup is awesome!). Thanks Susan! I appreciate your support. <3My mom's look nice than mine. She's the one that taught me and I forgot a step so mine don't look quite like hers.I'll try to update this post if I am able to capture every step in how I fold mine in the near future. Thanks Jenny! I hope you like my recipe. It's very light due to the amount of veggies that I personally use. :)I make wontons too but I'm partial to dumplings. Thanks Lisa! I privated the other ones so I only have the dumpling one public for now. I could definitely feast on dumplings all day.